Clathrochelates are compounds which contain a metal ion encapsulated within a three dimensional cage of macrobicyclic ligand atoms. Within this cage the metal has unique properties and is to a great extent isolated from environmental factors. Such complexes are suitable as models of the most essential biological systems, membrane transport, electron carriers, highly selective and sensitive analytical reagents, catalysts for photochemical and redox processes, cation and anion receptors, etc. The aim of this monograph is to generalize and analyze experimental and theoretical data on clathrochelates in order to promote further research in this promising field of chemistry. 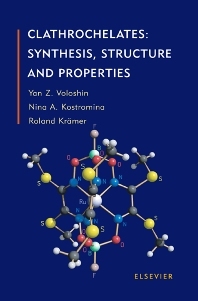 Chapter 1 gives general concepts of complexes with encapsulated metal ions, discusses basic specific features of these compounds, considers and characterizes the main types of compounds with encapsulated metal ions and the main classes of clathrochelates, and includes the current nomenclature. Chapter 2 deals with the pathways of clathrochelate synthesis and the general procedures for the synthesis of macrobicyclic tris-dioximates, phosphorus-containing tris-diiminates, sepulchrates, sarcophagi-nates, and polyene and other types of clathrochelate complexes. Chapter 3 concerns studies of the electronic and spatial structure of clathrochelate complexes. In Chapter 4, the kinetics and mechanism of synthesis and decomposition reactions of macrobicyclic tris-dioximates, sarcophaginates, and sepulchrates in solution and gas phases are discussed. Chapter 5 considers the electrochemical, photochemical, and some other characteristics of clathrochelates and their applications associated with these characteristics. Finally, the practical applications of the unique properties of clathrochelates and perspectives on the synthesis of new clathrochelates are described in Chapters 6 and 7, respectively. For chemists and biochemists in academia and industry. Selected Papers. Fundamental Concepts of Complexes with Encapsulated Metal Ions. Classification of macropolycyclic ligands. Nomenclature, abbreviations and classification of clathrochelates. Synthesis of Clathrochelates. Synthesis of macrobicyclic tris-dioximates. Synthesis of macrobicyclic phosphorus-containing d-metal tris-diiminates. Synthesis of sepulchrates and sarcophaginates. Synthesis of polyene and other types of clathrochelate complexes. Spatial and Electronic Structure of Clathrochelates. Sarcophaginates and sepulchrates. Macrobicyclic phosphorus-containing d-metal tris-diiminates. Macrobicyclic d-metal tris-dioximates. Polyene and other types of clathrochelate complexes. Kinetics and Mechanism of Synthesis and Decomposition of Clathrochelates. Experimental approaches. Reactions of boron-capped iron(II) dioximates. Reactions of sarcophaginates and sepulchrates. Properties of Clathrochelates. Ion association of clathrochelates in solution. Electron-transfer processes in macrobicyclic complexes. Photochemical properties of macrobicyclic complexes. Application Possibilities of Clathrochelate Chemistry. New Types of Clathrochelates: Perspectives of Synthesis. Ribbed-functionalized d-metal tris-dioximates. Mononuclear and polynuclear &agr;-dioximates and -&agr;oximehydrazonates obtained by capping with several p-block elements (arsenic, bismuth, and some others), d- and f-elements. Macrobicyclic Schiff bases formed by capping with Lewis acids. Clathrochelate complexes formed by the analogs of &agr;-dioximes and &agr;-oximehydrazones. Superclathrochelate structures.